Whilst birding the ‘patch’ on 6th January 2013, I came across a small wheatear catching insects from a large boulder strewn area behind the percolation pond. I went to this area to see in anything interesting was there as it is quite good for Wheatears. 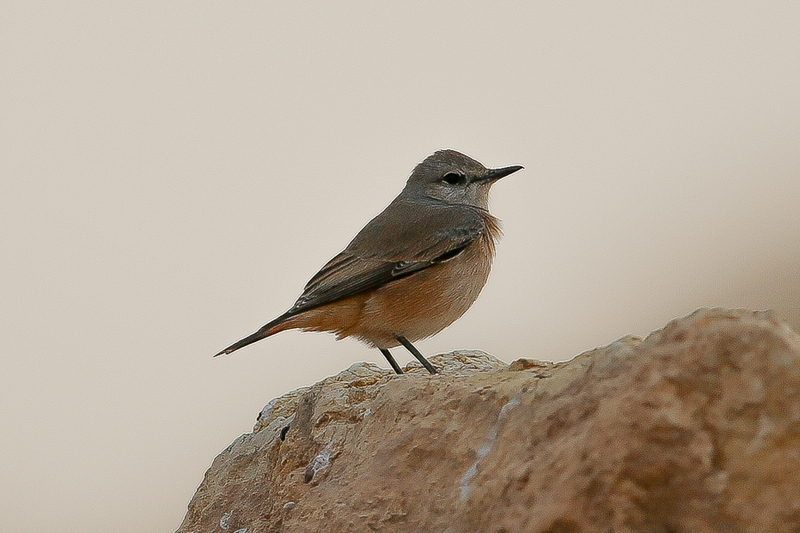 I was, however, pleasantly surprised to see a Red-tailed Wheatear as this is a new species for me for Saudi Arabia and more importantly for me, for the ‘patch’ as well. I have now seen 186 species on my local bird-watching area and am hoping to progress further towards 200 species by the end of the year. 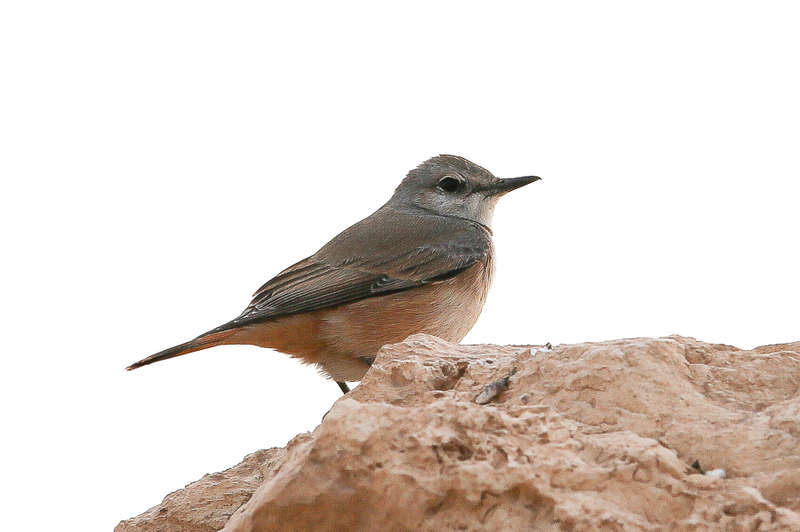 Red-tailed Wheatear has been seen previously in Dhahran some years ago on the main jebals but there have been no records of the species in this area since I have been in Saudi Arabia. AbdulRhahman Al-Sirhan from Kuwait, found one last winter north of Qatif. 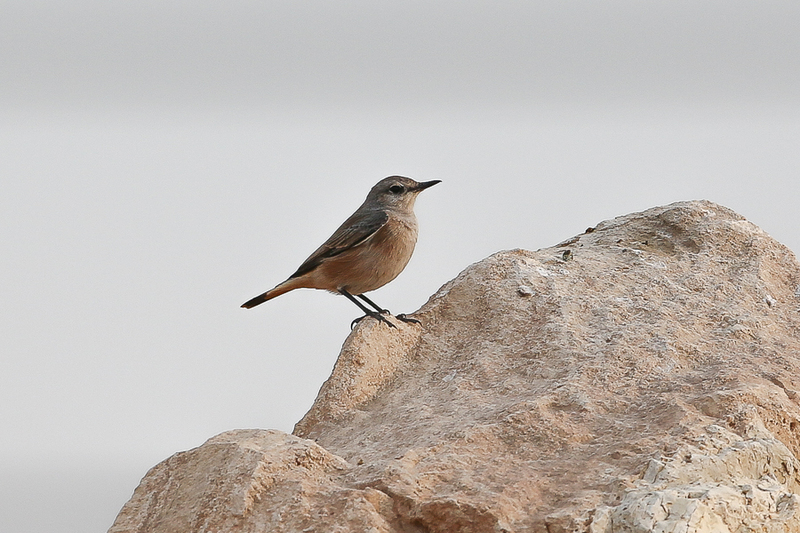 The Red-tailed Wheatear Oenanthe chrysopygia is a scarce winter visitor to the Eastern Province of Saudi Arabia with birds occurring from late September until early April, especially in the vicinity of jebals, other rocky outcrops, dry scrub areas and semi-desert. It breeds in an area from north-east Turkey through Armenia, Azerbaijan, Iran, Tajikistan, Afghanistan and western Pakistan while it winters to the south from southern Iraq, across the Arabian Peninsula, Iran, eastern Afghanistan, Pakistan and north-west India. Although they breed from 1200 – 4000 metres above sea level they winter down to sea level. I was unable to photograph the bird as it was late in the evening but went back the next day to see if the bird was still present, which fortunately it was. As it was slightly earlier in the day I managed to take a few photos, although not the best they at least show the bird.